Jared Unzipped: Gasoline Has A Short Lifespan. A can of gasoline blended with ethanol will not last as long as you might think. The average shelf life of E10 gasoline is approximately three months or less. With the adaption of blended fuels in the modern automotive era, the life span of gasoline has grown much shorter. This is chiefly due to moisture absorption. Ethanol-blended fuel absorbs water at a much faster rate. If E10 gas is left in a can with any manner of leaks, or in an area prone to temperature fluctuations, it will absorb the ambient moisture in the air and become unsuitable for use in an engine. 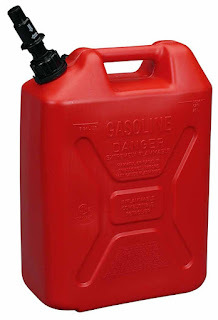 Remember folks -- keep your gasoline stored in a secure, airtight manner. Do not let water mix with the gas. Keeping the cap on is important!